The Vikings inked Kyle Rudolph to a five-year extension and Daniel House provides all the contract details. 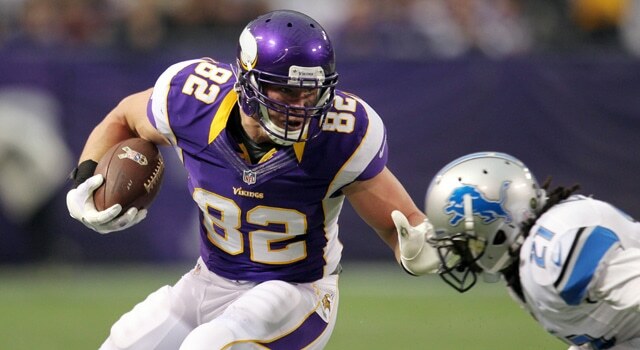 Kyle Rudolph has inked a new contract extension with the Minnesota Vikings. The news was first reported by Jay Glazer on his personal Twitter account. The team later confirmed the report on their official Twitter page. Rudolph reportedly agreed to a 5-year deal, worth $36.5 million. Rudolph will receive $19.4 million guaranteed and $12 million is guaranteed for injury only. The Vikings made signing Rudolph a priority before the 2014 season and locked him up in anticipation of a massive year in Norv Turner's offense. Rudolph has battled injuries during his three-year career with the Minnesota Vikings. The team drafted him out of Notre Dame in the second round of the 2011 NFL draft. He has 109 career catches, with 1,055 yards, and 15 touchdowns in his career with the Vikings.